The Light of Christmas Tree Project continues to grow each year, for its fourth year it has hit a record breaking number of participants. Pictured are decorated trees from a past Light of Christmas. 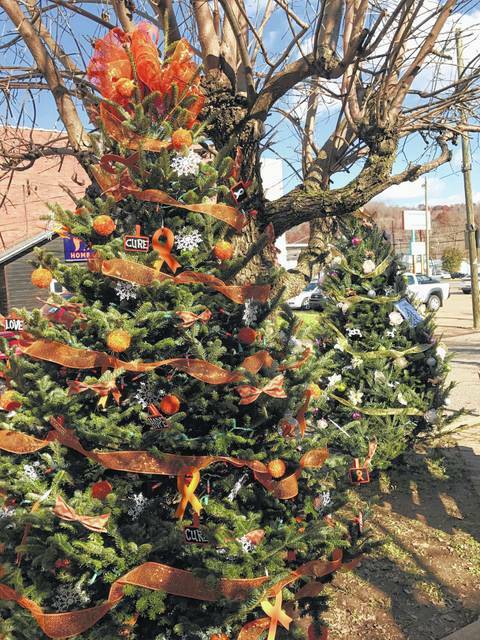 POINT PLEASANT — The Light Of Christmas Tree Project has reached a record breaking number of participants for its fourth year. Brandy Barkey Sweeney, event organizer, shared she currently has 36 trees to be decorated this Saturday, Nov. 24., from 4:30-6 p.m., at Gunn Park. Participants are a range of residents who are affiliated with Mason County schools, local businesses, churches, organizations, groups, and clubs as well as individual residents. All proceeds from the participants go to The Mason County Toys for Kids Association to buy gifts for local children. “I’m absolutely thrilled to have so people participating this year and I know it will grow each year,” said Sweeney. On Saturday, a committee member will direct participants to their designated spot in accordance to their tree’s size. The project committee will provide those decorating a tree with two stakes; however, if a tree requires more than two stakes, the additional stakes must be provided by the participant. Participants must provide their own extension cords, LED lights, and decorations. Also, a sign should be attached to the tree stating the purpose of the tree and/or the business/group name who is sponsoring the tree. Participants are advised to weatherproof their decorations with zip ties. Tree decorating may be done this Saturday or any day until Thursday, Nov. 29 as the lighting of the trees will take place following the Point Pleasant Christmas parade on Friday, Nov. 30 at 6 p.m.
After Jan. 1 to Jan. 5, participants must remove any decorations from their trees they may wish to keep as the trees will be disposed. All monetary votes for the People’s Choice tree will also be going to the Mason County Toys for Kids Association. Also, Sweeney extends a thank you to Rural King and Southern States for the support these businesses have shown for the project.